I wrote back in June about a part of the English uplands that I had neglected. Another part I have regarded similarly is the Forest of Bowland. This mass of moorland lies, slightly detached from the main Pennine spine to the east of Lancaster. It is only an hour and half’s drive from home. So I was due to put my shameful treatment right. This I did in the last month with two separate day trips. The objective was to climb the five Marilyns that lie in the area. I would also to explore a little further as well. I was reminded that this area was covered in a series of books published in the 1980s by Diadem Press and compiled by Ken Wilson and Richard Gilbert. These books were fairly revolutionary at the time, at least in the UK, in providing a coffee table sized hard backed publication with detailed route descriptions of walks in the British Isles and generally good quality photographs to illustrate them. 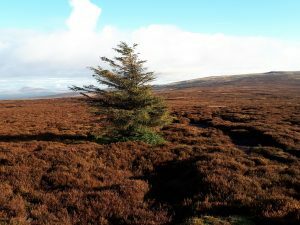 There was a route in each of Classic Walks and Wild Walks that covered the Forest of Bowland. 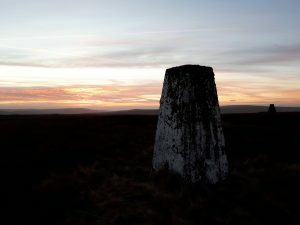 The former had a route covering Ward’s Stone, the highest point in the Forest of Bowland at 563m. I did not follow its suggested route though did overlap it to a degree. 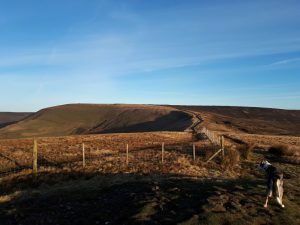 It describes Bowland as a “secret place, curiously difficult of access despite its nearness to Lancashire’s teeming cities.” It also said “you will see more “Keep Out” notices in Bowland than in any comparable area of Britain”. Of course this was in the days before the Countryside and Rights of Way Act 2000 which introduced the right to roam over mountain, moor, heath or down together with other areas. Still the Forest of Bowland remains relatively untouched apart from a few tops. It is land largely owned by the Duke of Westminster and United Utilities, especially in its northern parts. Apart from livestock farming, the land is given over to grouse and other game shooting. Shooting tracks can conveniently be used on occasion. But there are also vast tracts of bog. Like the northern Pennines there is a feeling of bleak spaciousness. It is an area where you can lose yourself, or indeed get lost if the clouds are down (as they often are here). 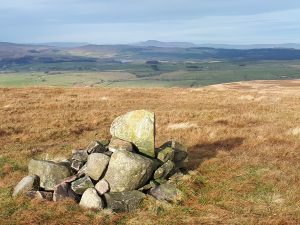 My first day involved three separate walks covering tops in the south of the Forest of Bowland. These three would cover Fair Snape Fell, Longridge Fell and Easington Fell. The day was bright and cold with a hard frost. I was going to tackle Fair Snape Fell first, from the south. The start point is at the junction of Startifants Lane and the private road to Wolfen Hall south east of the aptly named Fell Foot. This is to the north of Clitheroe up miles of narrow winding lanes. I had Jet with me today as the routes across access land that I was going to take did not restrict dogs. We were the first car there. 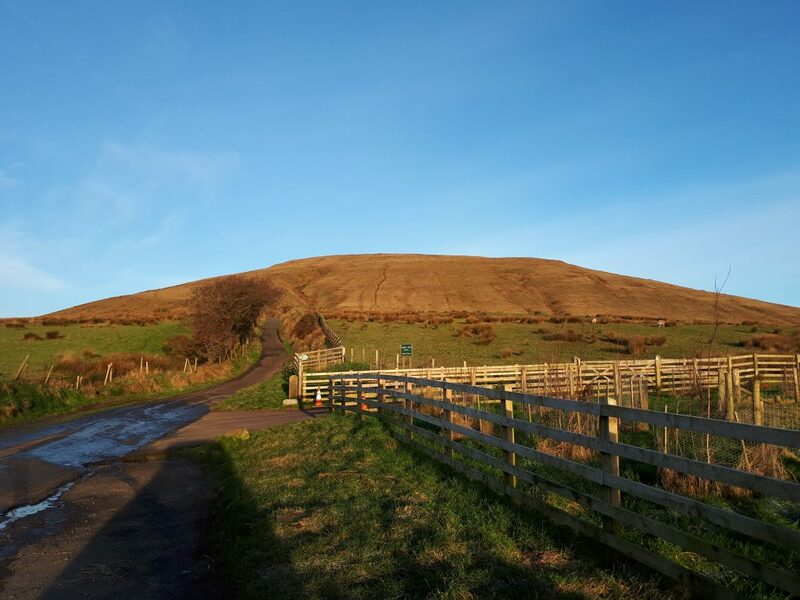 We followed the road up to Fell Foot where a public footpath then takes you steeply up to the first top, Parlick, which glowed in the morning sun. The rise is not sustained and we were soon at the tumbledown cairn at the top. The way from there onwards is straightforward. For the summit of Fair Snape Fell (which is not at the trig point shown on the map) we stayed to the right (east) of the fence down to the col between Parlick and Fair Snape Fell and then most of the way up the rise ahead. Part way up the rise there is an indistinct path that branches to the right and crosses the boggy moor. 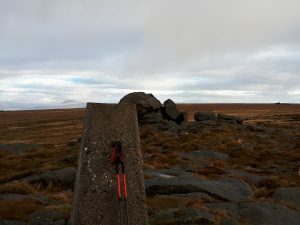 The summit of Fair Snape Moor is on the ridge line ahead. If you can find this path, it does become stronger (if wetter) and will lead you to a fence with a wooden gate (that must be climbed). 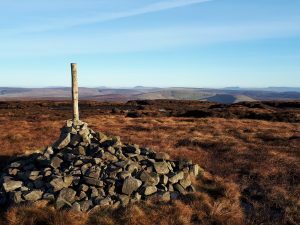 The summit cairn with a large wooden stake is now ahead. The last few metres were on a flagged path, then through a kissing gate. The distant views are extensive with an interesting profile of Whernside from this angle. As usual from these parts, Ingleborough dominated the view to the north. We then turned south west towards the trig point. Fortunately the bogs were largely frozen so the way was easy enough. In warmer, wetter conditions I can imagine that this stretch would be somewhat trying. 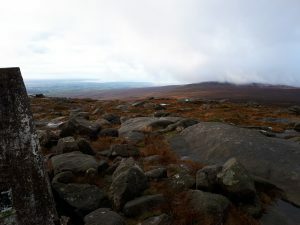 There was a bit of a gathering of some fell runners and another walker at the trig and nearby shelters and cairn. So we had a bit of a gossip before following the edge of the escarpment south east and then south back towards Parlick. 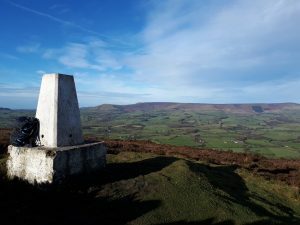 There are better views from the trig out towards the Irish Sea and up to the Lake District with Black Combe standing out, Ward’s Stone and Fylde. I forgot to look out for Blackpool Tower, but I imagine that it must be visible. Paraglider enthusiasts were setting themselves up on Parlick on our return. There was not much wind, but we did not wait to see if they were going to be successful in launching themselves. Next came Longridge Fell. This lies south across the valley of the Rivers Loud and Hoddle from Parlick. It is possible to drive through the pretty village of Chipping and up to Jeffrey Hill on the southern slopes of the valley. Here there is a car park marked as such on the Ordnance Survey. Longridge Fell was a straightforward, if by now wet, out and back from the car park. There is a permissive path from the car park that leads towards the distant block of trees. The early morning frost had by now m elted leaving us to find occasional oases of relative dryness. The path arrived at an intersection of a wall by the trees. The wall was then followed and in a further kilometre the top, marked with a triangulation pillar was reached. We passed a small group of horses grazing. They must have been used to human interaction because they looked up and then continued munching. The view across to Fair Snape Fell is good but the woodland obscured the views around the southern arc . We stopped for something to eat and then returned roughly the same way. This bit was less than two hours return including the stop at the top. Finally we drove around to Easington Fell. This was a half hour drive away but at least it was generally on the way home. This ascent was similar in characteristics to Longridge Fell. 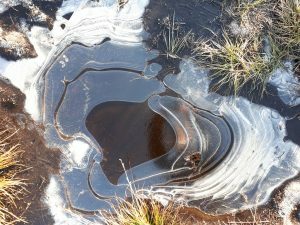 It involved another bog trot from the quarry on Waddington Fell about 6km north of Clitheroe. Navigation would be easy even in poor weather. First we followed the fence-line and then a wall. A man with a gun intersected our path about 50m ahead of us, but other than giving a quick glance ignored us. Once the edge of the woodland was reached, the summit cairn soon came into view sitting on the bare grass 100 metres or so from the edge of the woodland. 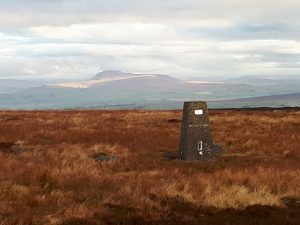 Easington Fell is fairly uninspiring hill though with a nice long distance view to Ingleborough and Pen-y-ghent. I varied the return slightly so that we followed the footpath to Walloper Well. On the way down there was a view south to Pendle Hill (and the concrete factory in Clitheroe). From there we crossed the road and ascended Waddington Fell. This was done as insurance against someone coming along later to re-survey it and Easington Fell and deciding that Waddington Fell is higher. 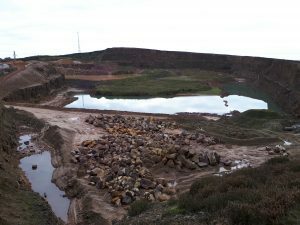 The Ordnance Survey shows 396m spot heights for each top, though with adjacent quarry workings perhaps I need not worry that Waddington Fell will take Easington Fell’s Marilyn crown. With the shorter November hours light was fading as we followed a squelchy trail adjacent to the fence around the quarry. This led inexorably up to the summit trig and slightly higher ground at the corner of a wall. On the way up we passed another mad bagger and his black Labrador. We did not stay long at the top. It was almost dark and it was time to go home. This time I did not take Jet. Although we have the right to roam this does not extend to dogs where the land owner so stipulates, one of the concessions that had to be accepted if the legislation was to be passed. Allegedly dogs disturb birds. This in an area which is effectively a wildlife desert where the only birds to be seen are grouse and the occasional passing gull or corvid. Day 1 had involved three walks. Day 2 was going to be one of two walks. The first was to climb Ward’s Stone and Clougha Pike. Approaches from the east take you through the narrow pass known as the Trough of Bowland and then drops into the upper Wyre valley. Soon there is a right turn up a narrow no through road to Tarnbrook. This is a run-down hamlet. There is nowhere convenient to park there. But about 600m short of the end of the road there is a large grassy area where cars can be parked. So I parked there. I was nice and early, but I did not have the frost of my previous visit so I was concerned that the going might be quite gooey. I wandered along the road to Tarnbrook. Just after the first dwellings there is a patch of grass and a gate into the fields on the left. Here there is a permissive path towards the moor with the gate festooned with signs including one making it clear that dogs are not welcome. A 4WD track then leads across some initial fields before climbing more steeply up parallel to Tarnsyke Clough to a feature shown as Luncheon Hut – presumably where the shooters eat. Above the building the track splits. I went straight on and the track soon runs out at a large vehicular turning circle. But a path continues on from here serving the grouse butts above. I followed the line of butts and by now was up near the 500m contour. The ground was less wet than I had feared. Ward’s Stone has two triangular pillars, one at each end of its broad plateau. The one at the east to which I first headed is shown with a spot height of 561m. The one to the west has a spot height of 560m. 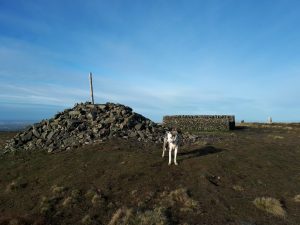 The true summit is the top of a peat hag about 60m west of the eastern trig. From this eastern vantage there was a fine view of the ever present Ingleborough, which is my favourite Pennine hill – I have been up it well over 20 times! The western trig also looked higher from here! There is a path of sorts that runs between the two trigs and it became boggier as I went westwards. 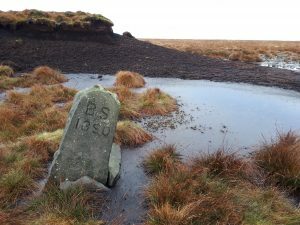 At one point an old boundary marker could be seen leaning gently in its sea of peat. The western trig was reached with some sort of communications gadgetery 100m to the south. It was time for something to eat, if only because the view had suddenly become rather nice. Instead of Ingleborough, the arc to the west had open up. A fell runner who was probably also around my advanced age came by. We had a brief chat before he went off returning the way he had come and the way I was to go. I could also see the next object, being Grit Fell around 3km to the west with cloud brushing its top. The ground between looked quite rough and peaty and presumably wet. To start it was just rough and peaty but it became wet as the low point between Ward’s Stone and Grit Fell was reached. There was a brief respite where a vehicle track passes over the broad col. The wet path continued. At one point there is a tree growing in the midst of the moor with no other tree anywhere near. Odd. Beyond the ground became drier and I was soon at the cairn on Grit Fell. 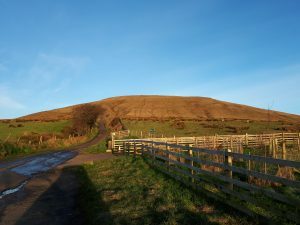 Clougha Pike is a further couple of kilometres to the west. This section probably offered the roughest ground of the day and I was glad to reach this point. 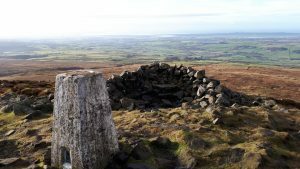 Clougha Pike is renowned for the view to be had from it. 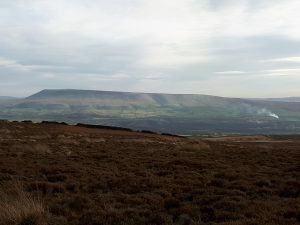 Sitting on the western edge of Forest of Bowland it commands views up the western side of the Pennines, to the Lake District and Barrow-in-Furness, over Lancaster and down to Fylde. Allegedly Blackpool Tower and the Isle of Man can be seen. But today there was too much cloud and murky atmosphere for that. Nonetheless the views were great. It was also the place where I saw the most people on either of the days I was in the Forest of Bowland. I spent 20 minutes here having some lunch and admiring the views (and the energy of a few passing fell runners). Trail Magazine once asked its readers to vote for the 100 greatest British mountains/hills and Clougha Pike made it into the 100. It is not really a hill in its own right as it is really just an appendage to Grit Fell, but there we go. It’s on the list. It was then time to leave. I reversed my route over Grit Fell and past the lonesome pine to the vehicle track. From there it was a straightforward descent down the track, ignoring the branch to the left at Grizedale Head, down to the road at Higher Lee, thence Lower Lee and along the road back to the car. After a bit more food and drink there I reckoned that I ought still to have time to get to my final objective, White Hill, that day. This involved a drive back over the Trough and then to Slaidburn and north again past Stocks Reservoir. It was pretty gloomy when I reached the car park at Cross of Greet. So I needed to get a move on. White Hill is a couple of kilometres away across extremely wet ground. A fence can be followed but in places this leads you into extremely marshy terrain. So caution has to be taken. 40 minutes saw me to the top without having fallen into any boggy holes. I was met by colourful clouds to the west as the sun had now dipped below the horizon. Nearby the summit trig there is one of a series of watch towers built by the water utility when tunnels and other infrastructure were being built in the 1800s. Unfortunately I did not have time to explore this as it was now getting pretty dark. So I made my way back in the gloom. I managed to place both of my feet into peaty holes on the return trip. Fortunately my boots and gaiters managed to repel most of the water and I safely returned to the car in the dark. So that was it for the Forest of Bowland. I must go back one day. It has a certain aura to it. There are some picturesque villages flanking its slopes and valleys with a remote feel.